I had planned to write about something completely different this month, until I saw this posted on a friend’s Facebook page. I saw the picture and thought, Yes!! Oh how I wish that everyone could understand and appreciate this! I know I’m not the only one who reacted the way I did when I saw that picture. 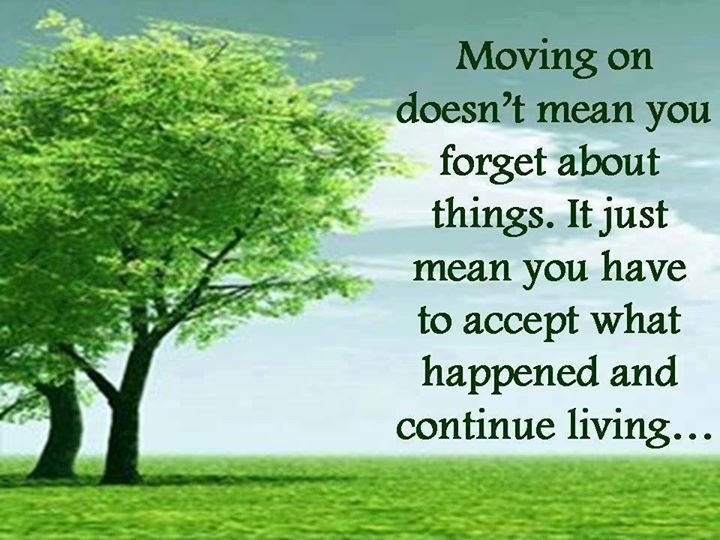 I know that so many of you despise that “moving on” phrase. And I know that far too many of you have been the victim of some who feel that your “moving on” means you’re “forgetting” your past. I cannot tell you how much I want the phrase “moving on” removed from our vocabulary. I’d like to make it illegal for anyone to ever say it again in a negative way. I’d much rather hear, “moving forward” – it has a much more positive sound to it, don’t you think? So what are we to do after loss when we want to smile again? Is it wrong to have fun? Can we start to enjoy life without so much guilt? What will others say when they see us out there in the real world? Can we meet up with friends for dinner and laughs? Is that considered “moving on”? What will people say if we start to date again? Is that bad? Does that mean we’re forgetting about the ones we’ve lost????? You and I know that nothing could be further from the truth! I’ve heard it said about me and I’ve heard it said about others. Something as simple as being spotted at dinner with some girlfriends and having a good time can be seen as negative. I’ve even been told that it’s disrespectful and inappropriate. It makes others uncomfortable – mainly because they don’t know how they themselves would be able to go on after loss. I suppose if we look at it that way, the appropriate thing to do is to stay home and grieve until the world is ready to see us again. Oh how I would love to let everyone in on a little secret that we all share – none of us really know how we are able to go on after loss. You and I, and anyone else who has experienced the loss of a spouse or a child, know that there will never be a day when we forget. We know that our loss is with us every moment and that, “moving on” means exactly what the quote says. It’s about acceptance – plain and simple. Accepting what happened and moving forward with life. It’s tough for sure, because it forces us to start living and enjoying again and everyone’s time-frame is different for that. But when we do reach the point of acceptance, it means we allow ourselves to smile and laugh, to show our kids that life can still be fun, to perhaps even allowing ourselves to love and be loved again. The sad part about acceptance is that not everyone will agree with it and some will make their feelings known. The good part about it is that you don’t have to give those negative words any of your time! That’s why I love this quote so much. It’s strong, plain and simple and gets directly to the point. Our happiness does not mean that we aren’t grieving – it simply means that we are dealing with the deck we were given in a game where there are no do-overs or trade-ins. We’re doing the best we can at “Moving Forward” – smiles, laughs and all! It’s as simple as that. This entry was posted in General by camperinparents. Bookmark the permalink. I’m resharing this, with a tip of the hat to Joan Hitchens of Navigating Grief, who shared it on Facebook. Personally, I disagree with the imperative, ‘you have to…’. I would argue that this is the simple fact of moving on. If I am utterly honest, I am still in the process of moving on from the loss of Kim, but that is the level on which this post speaks to me. Enter your email address to follow Camp Erin Parents Blog and receive notifications of new posts by email.